Since July people all across America have had Pokemon GO Fever. Players have ventured to places they’ve never been before in search of the imaginary critters. This new form of exploration is a potential boom for businesses in Delaware’s tourism industry. Here’s how Pokemon GO works. It’s a smartphone app that uses “augmented reality” to allow players to walk around and “catch” Pokemon. Pokemon is a wildly popular media franchise with video games, card games, TV shows, movies and more in which “trainers” catch and then battle creatures with special powers. 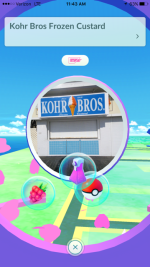 In Pokemon GO the animals can pop up anywhere, but sites called Pokestops and Poke Gyms – both extremely important in the game – are in set locations. Players are drawn to these places – often important historic, cultural, etc. locations – and that’s how your business or organization can use the game to help drive visitation. Make a list. Start by putting together a rundown of all the Pokestops and Poke Gyms in your area. This will give you a starting place for seeing if you have a lot to attract players. Find the rare. If you have time, also create a list of confirmed sighted Pokemon in your area. If there are rare ones around your location, you can use that to help draw players. Set a lure. If you’re location is a Pokestop, you can purchase Lure Modules for a dollar (they can also be bought in bulk for less), this will help attract Pokemon and therefore players to your location for 30 minutes. Go social. Show off your attraction, and if possible rare Pokemon, by posting the in-game augmented reality pictures of uncommon/rare Pokemon on Facebook, Twitter, Instagram and Snapchat. Reward players. Put up a sign or post on social media that players who catch a Pokemon at your location (prove it by taking an in-game photo) can get a discount on items or a small prize. Create a contest. Use social media to set up a contest to invite people to play and try to catch Pokemon at your location. Whoever shows they caught the most wins! Have what they need. Pokemon GO is both data and battery intensive, so letting people know you have free Wi-Fi or charging stations will likely bring players to you. Tag ‘em and check ‘em. If you see people playing Pokemon GO around your attraction, ask them to tag the photos of Pokemon caught at your location on social media and/or check in while they play there. Encourage players to battle – If your location is a gym or is near a gym, tell people to come by to battle. Battling to take over a gym takes a while, so people will end up spending a long time there. 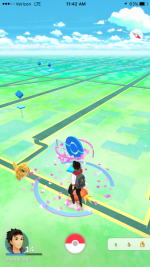 Check Yelp – Your location’s Yelp listing can now show if it is a Pokestop. Make sure, if yours is one, that it’s showing up as such on the website. Players can certainly be a potential asset for you. Embracing the opportunity and using some of these suggestions to entice them can pay big dividends for you and the community you serve. With your new tools for using Pokemon GO to draw visitors, GO out there and turn this phenomenon into phenomenal returns for your location.